Hydrangeas have been cultivated in western gardens since the first American species were brought to England in the early 1700s. Hydrangea macrophylla, the common, big-leaf hydrangea are native to Japan where they were grown for hundreds of years. There it was treasured or the flowers and foliage, but also used as an herb. Today, there are over 100 species of Hydrangea, and within those many subspecies, and cultivars. There is enormous variation in size, flower type, and cold hardiness, even within a species, which make it difficult to generalize. Hydrangea macrophylla, also called big leaf or French hydrangea, has either pink or blue flowers that is determined indirectly by the soil pH, which affects the availability of aluminum in the soil. In acid soils the flowers will be blue, in alkaline soils the flowers will be pink. Aluminum is available to the plant in acid soils. Research has determined that the actual mechanism of color variation is due to the presence or absence of aluminum compounds in the flowers. Big leaf hydrangeas are effective as single plants, massed together, or large container grown for on patios. They usually start flowering in June and won’t stop until frost. With the shortage of good all-summer plants, hydrangeas deserve a spot in everyone’s garden. Whites, pinks, and reds are represented along with the expected blue, and there are plenty of different forms available. With a little care and patience, you can grow hydrangea shrubs from simple cuttings. Because of the wide variety of Hydrangeas available, it's important you know what you are getting. If the plant you're considering is not in bloom at the nursery, ask to see a picture of the flower. If no picture is available, go elsewhere. Also make sure you know exactly what species you are getting, how cold hardy it is, and how large it will grow. Once you've selected your a healthy plant, growing it is relatively easy. Most hydrangeas are natural woodland plants and like some shade— not total shade. Morning or late afternoon sun is best, but flowers can burn if exposed to hot mid-day sun. If for some unknown reason you happen to plant your hydrangea in a poor location, it is usually easy to move. Hydrangeas have a relatively small compact root ball. Hydrangeas will grow in almost any soil, but will do better if the soil retains moisture. They should be watered frequently enough that the soil does not completely dry out. Hydrangeas don't need special fertilizing. A good balanced fertilizer can be applied in late winter or early spring. Mulching is a good practice as it helps hold in water around the roots of the plant. Hydrangeas fail to flower for several reasons. The most common reason is frost damage, followed closely by late pruning. Too much shade or nitrogen are other likely culprits, but lets look at siting our plant and pruning as our best controls. If your hydrangea is not flowering look at your growing practices and where you have it planted and make appropriate changes. Partial shade means more than 4 hours (6 is better) of sunlight. Finding a more sheltered spot may help. But I suspect that the reason 9 times out of 10 is pruning practices. Incorrect pruning is the biggest downfall of hydrangeas. Too much pruning and the macrophylla's won’t bloom. Vine and big leaf types should be pruned immediately after flowering or not at all! Cut back to a good pair of buds, the last pair if you want to dwarf the plant back some. The panicle hydrangeas should be pruned in winter or very early spring and pruned HARD. Selecting 5 — 10 canes will produce the huge panicles most people are looking for. Besides, at 15', Pee Gee needs reigning in. Cut it back to that last pair or two of buds. You’ll be glad you did in 10 years. Endless Summer is the first Hydrangea macrophylla that blooms on both old and new wood. Flowers virtually all season long and is hardy to zone 4. Endless Summer will produce magnificent pink, grape, or blue blooms depending on the pH soil level. Alkaline (pH 6—7) will produce pink blooms. Acidic soil (pH 5—5.8) will produce blue ones. Dig V-shaped hole 2-3 times wider than container. Carefully remove container: cut any encircling roots. Roughen sides of root ball for better root penetration. Center plant in hole, keeping it straight. Set top of root ball slightly above ground level. Backfill soil to 3/4 full. Water thoroughly. Finish with soil; compact lightly, then water. Add 2" — 3" of organic mulch, keeping away from base of plant. Endless Summer produces spectacular pink or blue blooms depending on the makeup of your soil. If you don't know the pH content of your soil, ask your garden center for a soil testing kit. Alkaline soils (pH 6-7) will produce pink blooms. More acidic soil (pH 5-5.8) will turn your blooms blue. To lower the soil's pH, add a soil acidifier to the soil before planting. Follow the directions on the package to encourage blue blooms throughout the season. To encourage re-bloom, remove spent flowers. Because Endless Summer blooms on new growth, you don't have to wait until the next season to see armfuls of new blooms. Stop all applications of fertilizer after August 15th to acclimate the plant for winter. Keep the soil moist through the fall months until the ground is frozen. Cover the plant with a 4" layer of organic mulch (wood mulch, leaves, etc.). There is no need to cover all stems to the tip or to cut them back. Covering should be done when fully dormant (around November 30th), or at the same time you would cover other perennials in your garden. In spring, uncover with your perennials when the ground is no longer frozen. The plant will grow from the base of the plant and also from any old branches that survived winter. Be patient. Growth will come slowly until the heat of late spring stimulates the plant to grow faster. Once you see growth you can prune back the old branches to a finger width above the new green growth. Sit back and watch your plant grow and bloom. Depending on your climate, this should happen around mid-July. Endless Summer Hydrangea is very forgiving and will not suffer if left un-pruned or if it's pruned at the wrong time. In fact, young, recently planted shrubs are best left alone. Unlike other Hydrangeas, your Endless Summer will bloom on both old and new wood—branches that grew last year and new branches from this year. Another unique feature is that this hydrangea will continue to set buds and bloom throughout the season; deadheading the spent flowers will encourage this. Feel free to cut the blooms for drying or fresh cut in vases because you will actually encourage the plant to produce more blossoms. If you choose to prune your Endless Summer, spring is the best time. Many people like to leave the spent blooms on their plant because it adds winter interest. This may also act to insulate the new buds from frost and cold. Do remove spent blooms in spring, however. Except for climbing species, hydrangeas fall into 3 groups. This group includes H. paniculata and these flower from mid-summer onward on current season's growth. These shrubs should be treated as other shrubs requiring hard pruning in the spring. These are the Mopheads' and Lacecap hydrangeas (H. macrophyla)and they also flower from midsummer, but on shoots made during the previous growing season. These include species such as H. aspera and they need only minimal pruning in the spring. THERE ARE CERTAIN INSTANCES WHEN PRUNING CAN BE HELPFUL: (1) All dead stems should be removed from hydrangeas every year. (2) After the plants are at least 5 years old, about 1/3 of the older (living) stems can be removed down to the ground each summer. This will revitalize the plant. (3) In addition, if it becomes necessary to prune a plant to reduce its size, it may be cut back in June or July without harming the next year's bloom. But it will return almost immediately to it's former size. This is one reason why it's best to plant a hydrangea where it does not have to be pruned. Hydrangeas can be made to change color Hydrangeas are fascinating in that, unlike most other plants, the color of their flowers can change dramatically. But it is NOT easy. The people who have the most control over the color of their hydrangeas are those who grow them in containers. It is much easier to control or alter the pH of the soil in a container than it is in the ground. Hydrangeas often change color on their own when planted or transplanted. They are adjusting to the new environment. It is not unusual to see several different colors on one shrub the next year after planting. It is easier to change a hydrangea from pink to blue than it is from blue to pink. Changing a hydrangea from pink to blue entails adding aluminum to the soil. Changing from blue to pink means subtracting aluminum from the soil or taking it out of reach of the hydrangea. 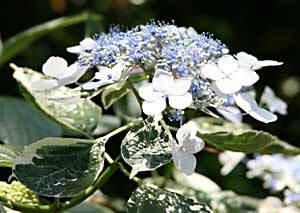 Aluminum sulfate may be added to the soil around the hydrangeas. Authorities recommend that a solution of 1/2 oz (1 tbs) aluminum sulfate per gallon of water be applied to plants (which are at least 2 — 3 years old) throughout the growing season. Important: Water plants well in advance of application and put solution on cautiously, as too much can burn the roots. To make the aluminum available to the plant, the pH of the soil should be low (5.2 — 5.5). Adding aluminum sulfate will tend to lower the pH of the soil. Another method for lowering the pH is to add organic matter to the soil such as coffee grounds, fruit and vegetable peels, grass clippings etc. If the soil naturally contains aluminum and is acid (low pH) the color of the hydrangea will automatically tend toward shades of blue and/or purple. Fertilizer will also affect the color change. Fertilizers low in phosphorus and high in potassium help produce a good blue color (25/5/30 is good. Potassium is the last number). Avoid super-phosphates and bone meal when trying to produce blue. It is virtually impossible to turn a hydrangea blue for any length of time if it is planted in soil with no aluminum and that is highly alkaline (chalky). Keeping the soil properly conditioned as stated would require plenty of care. Perhaps the best idea for growing blue hydrangeas in an area with alkaline soil would be to grow them in large pots using lots of compost to bring the pH down. Reduce the strength of the Aluminum sulfate to 1/4 oz per gallon of water. In a pot, it will be much easier to control the requirements for bluing. One last suggestion: it is important to have your water tested so it will not contaminate the soil that you have so rigorously balanced. The pH of the water should not be higher than 5.6. Planting hydrangeas near a concrete foundation or sidewalk will often affect the color since the pH of the soil may be raised considerably by lime leaching out of these structures, making it difficult to obtain blue. 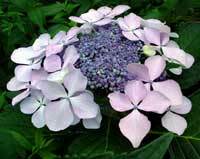 For hydrangea blooms to be pink, the plants must not take up aluminum from the soil. If the soil naturally contains aluminum, one must try to keep it away from the hydrangea's system. Add dolomite lime several times a year. This will help to raise the pH. Shoot for a pH of about 6.0 — 6.2 (If it goes above 6.4 hydrangeas may experience an iron deficiency). Since hydrangeas take up aluminum best at lower pH levels, raising the pH will help to keep the bluing effect of aluminum out of the hydrangea's system. In areas that naturally produce blue hydrangeas (soils with aluminum), consider growing pink hydrangeas in large pots. If hydrangeas are grown in pots, it would be best to use soil-less mixtures, since these mixes would probably not have aluminum in them. In a pot, it will be much easier to control the requirements for growing pink hydrangeas. One of the frequent questions asked is How to Dry Hydrangeas. There are all kinds of proposed methods. The single most important thing about drying hydrangeas is not which method you use, it's when you harvest them! Fresh, newly opened blooms seldom, if ever, dry well in the open air. It is best to wait until the blooms begin to dry on the shrub. The petals will have faded a bit and feel papery to the touch. At this point, you can cut them, strip off the leaves and air-dry them in a basket or vase with or without water. If you have the space and the time, hanging them upside down in an airy place out of direct sunlight works well, too. Believe it or not, many floral arrangers are now using cat litter instead of silica gel as a much less expensive way to experiment with drying hydrangeas. Use the finest textured, non-clumping cat litter available. You can also dry fresh blooms in silica gel to retain their natural blue or pink color. Silica gel, available at most craft stores, is actually a sandy substance that absorbs moisture.